The leaflet design – front side. 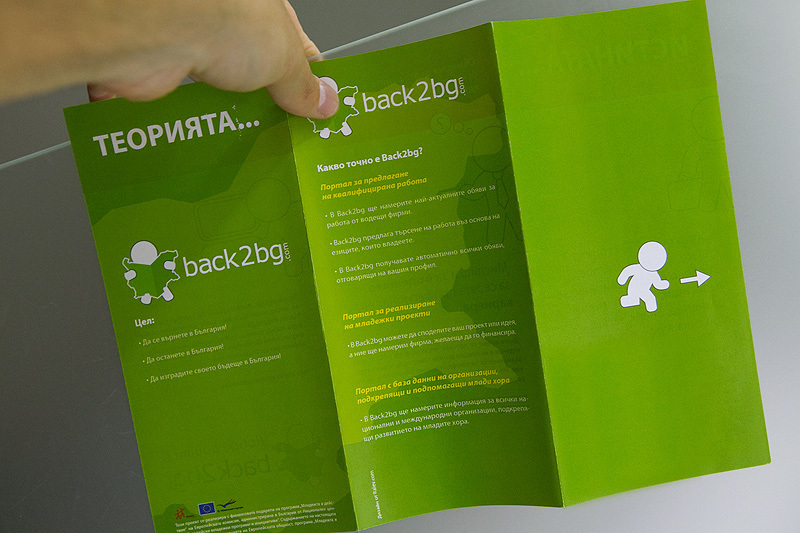 We are very happy with the branding designs we have created for Back2bg.com ( logo, stationery design, event branding, web header design, web banner design ). The project itself is very interesting because as the name says – it’s dedicated to people who have studied abroad and now want to find a job in Bulgaria. Like many of our works – this one is also designed to provoke questions and disguise answers. 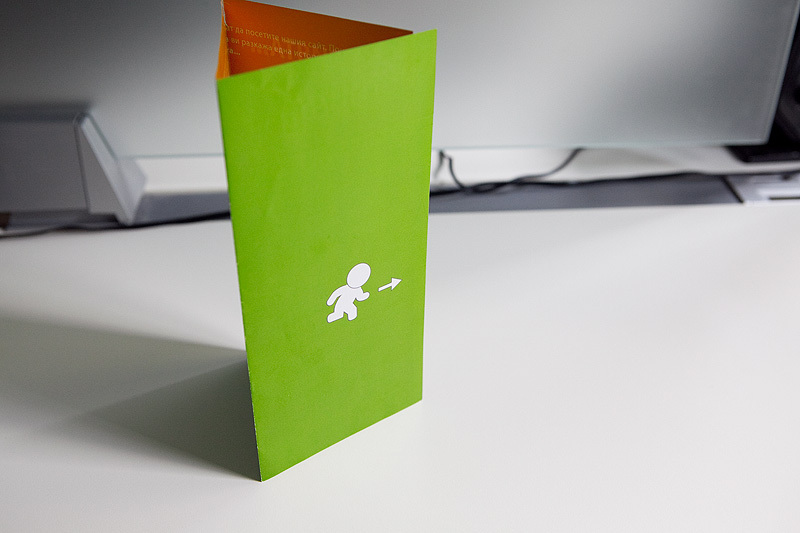 No title, just a little cute figure going somewhere… or maybe a funny ‘Exit’ pictogram sign? Sometimes the Exit is actually the place where you are coming from. The place where you are returning. Most people leave Bulgaria to study abroad and look for their happiness based on better economics and life standards. But some of them could not find it and they are returning. Others have planned to study abroad and return to Bulgaria to work for their happiness. Step backwards is sometimes the better opportunity. We designed a few more pictograms in order to further develop the idea from the logo design. We are talking about the character who’s reading the Bulgaria-mapped paper, trying to find a job. Now he has four more buddies – the “exit man”, the “employer”, the “wondering man” and the “web user”. The complimentary colors are yellow and orange, creating fresh and positive bond with the young but mature reader. 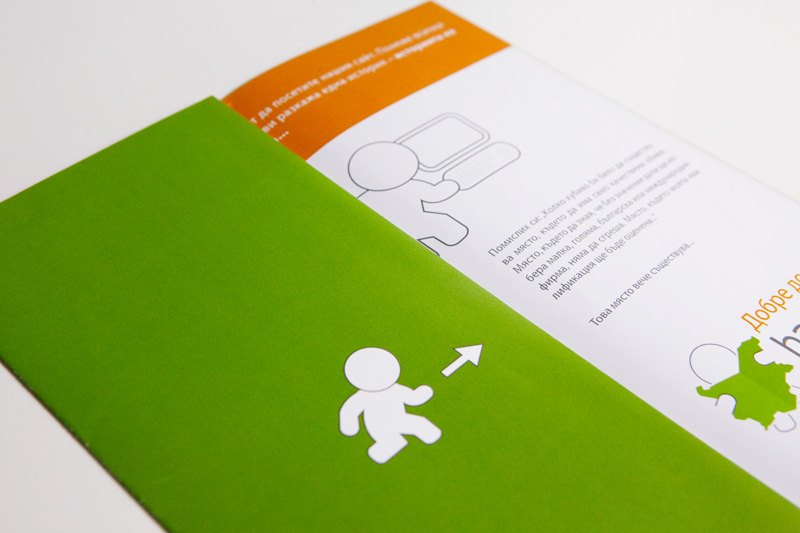 This is one of our favorite leaflet projects because the client trusted us with the leaflet design. What we came up with is a clean, modern, memorable layout.